Purim is a busy and joyous time around our schools and congregation. Everyone is invited to share in the merriment, and we hope you will! Megillah Reading – Book of Esther –The Megillah is read twice, in full, on Purim, once at night on Wednesday, March 20th following our Purimshpiel and again during the the day on Thursday, March 21st during an earlier than usual morning Minyan at 7:00 a.m.
Mishloach Manot / Shalach Manos – Sending Gifts –Every Jew is obligated to give at least one Mishloach Manot gift containing at least two different types of ready-to-eat food items. This is a wonderful opportunity to remember family and friends. 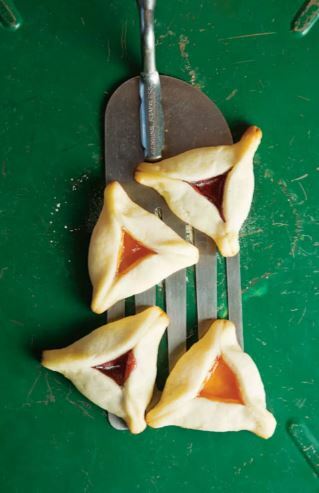 Hamantaschen are always nice to include in your gift-giving. Make your own or order some and support our Abraham Ratner Torah School fundraising. Order online or call the office at (619) 697-6001. Matanot La’evyonim – Gifts to the Poor –Giving to the poor is a mitzvah all year round. However, the mitzvah to do so on Purim is in addition to the general mitzvah of tzedakah (charity). This mitzvah may be fulfilled by donating non-perishable food items to our food bin that supports the efforts of San Diego’s Jewish Family Service Hand Up Youth Food Pantry. Seudah – Festive Meal –One is obligated to partake in a festive meal on Purim. We’re here to help. Join us, prior to our Purimshpiel, for our Purim Feast. Throughout our celebrations we ask that you remember those who are hungry. 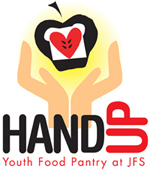 Bring non-perishable food items to fill our bin so that we can, in turn, give your contributions to San Diego’s Jewish Family Service Hand Up Youth Food Pantry. Bring noisy items (cereal, macaroni and cheese, couscous, etc.) to use to drown out the name of Haman. We’ll collect them at the end of the evening to add to our collection. Remember, hunger never takes a holiday. This year Abraham Ratner Torah School families will bake enough hamantaschen to feel a small army. Click here for all the yummy details. If you need further assistance, call Illana or Michelle at (619) 697-6001. This day of family fun will be one of Silverman Preschool’s biggest fundraisers of the year. Your support and participation will make it a success. Invite family, friends and neighbors. Everyone is welcome! Click here for more details. Enjoy our re imagined Purim carnival! There will be rides, games, balloon twisting experts, airbrush tattoo artists, a petting zoo, and more! “Stella’s Pizza Pie” food truck will delight us with their culinary excitement, and Hawaiian Shaved Ice will bring enjoyment to all.. Prior to our Purimshpiel, we invite you to join us for a Purim Feast. Our menu will feature veggie lasagna, salad and, of course, Hamantaschen. Click here for all the details. Wednesday, March 20th at 6:15 p.m.
Our annual Purimshpiel is known far and wide as an event not to be missed. Open and free to all, bring your friends, family and neighbors to enjoy the show! Read all about it now. You can hear the Megillah in full on Wednesday evening, March 20th, at approximately 7:30 p.m. following our Purimshpiel. Again, on Thursday morning, March 21st, the Megillah will be read during an earlier-than-usual morning Minyan at 7:00 a.m.